Lately, I have been inspired by traditional antique furnishings - think english chestnut and mahogany. The key to making these classic furnishings feel fresh is by adding a quirky or unexpected item into the mix. Hello lucite! Just enough to make the room feel a little hip and updated especially if you have a small space. 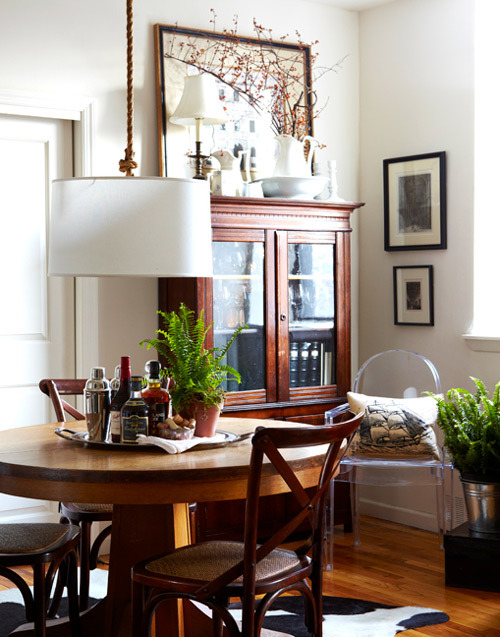 If you like this look, you should check out Rachel's NYC apartment on Design Sponge! I adore everything in her home! And, I mean everything! I love the addition of the ghost chair. I'd like to think I would not tire of this design iconic piece. 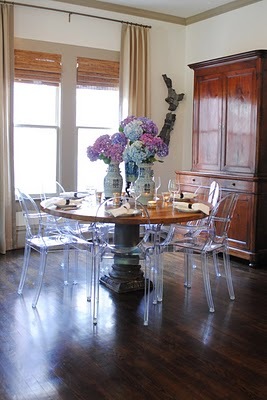 Meg Lonergan, who owns LeSueur Interiors, was recently published in November's BHG. 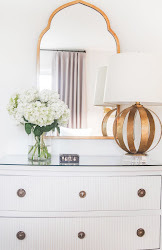 Fellow blogger, Ashley, has done a wonderful post on her interiors and style. Always a favorite. 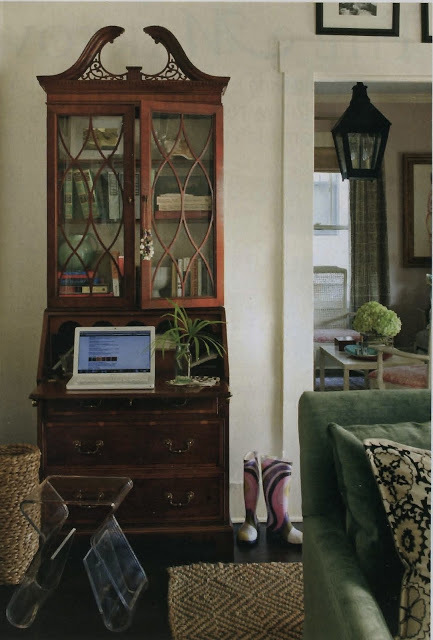 The unexpected lucite stool next to the english secretary is just the perfect example of embracing the unexpected. Lauren McGrath from Good Bones Great Pieces did a similar look here with a bobbin turned leg desk paired with a lucite stool. Her apartment was published in Traditional Home. So, I better start saving my pennies because a classic antique piece paired with lucite doesn't come cheap!! I always keep coming back to traditional furniture as well. You can't go wrong and mixed with some great fabrics and a dash of quirk like you mentioned - it's a great mix. I love that secreatary that you've shown above. Love me some lucite. Such a 70s child. I couldn't be more in love with the images you posted, Fran. I don't know how many times I've looked at that Design*Sponge house tour just to study the details. Thanks, as well, for the shout-out--I should have figured you were hip to Meg Lonergan well before I discovered her. Isn't she great? Fran you are so right! Something about the mix of high and low and old and new is so engaging! Hope you can stop by soon to enter my $50 Novica giftcard giveaway! Fran, you beat me to it! I had a post saved with three of your four images showing lucite and the antique!! After you told me to go see Rachel's apartment on NYC, I then got my copy of BHG in the mail and had the EXACT same idea as you, including the image of Steel Marcoux's home, which if you will remember is how I found your blog in the first place! I missed Lauren McGrath's image, however! Betcha that Ashley Putnam has an antique and lucite paired together SOMEWHERE in her house. So funny! Fran - So happy you visited my blog! 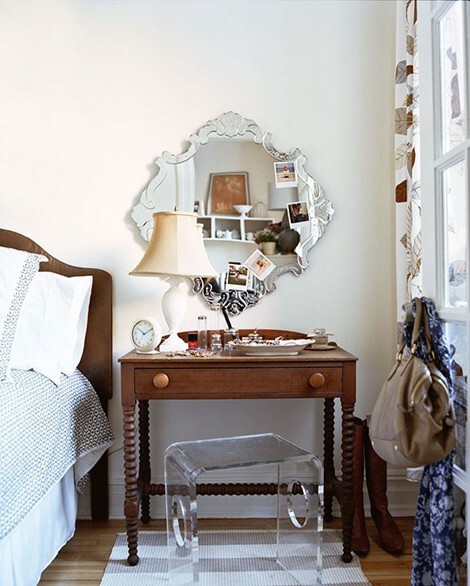 I love your posts - and I'm really loving your lucite finds, especially the pic of the desk-turned-vanity with the lucite stool. Fab!